Angular contact bearings are designed such that a contact angle between the races and the balls is formed when the bearing is in use. The major design characteristic of this type of bearing is that one or both of the ring races have one shoulder relieved, or higher than the other. 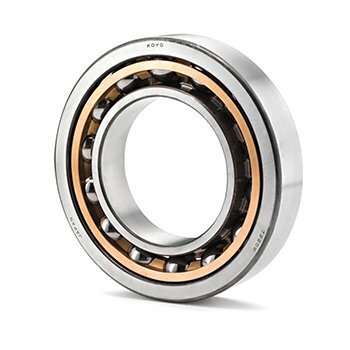 In order for these bearings to function properly, they must be assembled with a thrust load. This loading (or preload) creates a line of contact (or contact angle) between the inner race, the ball, and the outer race. The preload can be built into the bearing or created when the bearing is Inserted into an assembly. The contact angle varies from 15° to 40° and is measured relative to a line running perpendicular to the bearing axis. Angular contact bearings are unidirectional thrust bearings that can withstand heavy thrust loads and moderate radial loads. Bearing design for angular contact bearings can be one directional thrust, double directional thrust, double row, double row maximum capacity angular, duplex thrust, and four-point contact. Double row angular contact bearings can have a number of different styles of seals or shielding. Seals and shields provide protection from contamination and serve as a retainer for lubricant. Seals provide better protection and lubricant containment than shields, but have lower maximum speed capabilities. The different types include single/double seal or single/double shield.